The RAK Compact Wrap Over Urea Toilet Seat is a high-quality loo seat that fits perfectly with a RAK Compact Close Coupled WC. RAK products are renowned for their quality and this toilet seat is no exception. Hi Barry, as I don't have any measurements for this item I would be unsure if the rak product would replace it. Sorry we couldn't help more today. Q. need a rigid d shape soft close seat for a roca geraldo which do you recommend? Hi Steve, without the dimensions of the toilet, it is difficult to tell, but this toilet seat should fit a standard d shaped pan. Thanks! Hi Barry, this is a standard close seat. We do a soft close toilet seat option, which is product code COMSEATSC. Thanks! Hi Thelma, unfortunately we only stock this item in white. Sorry we couldn't help more, please let me know if you have any further questions. Hi John, this product is for a toilet seat. Thanks. Q. Is this seat suitable for the RAK standard back to wall pan COMBTWPAN and/or the RAK rimless 450 high BTW pan COMBTWPANM45SN and/or the RAK rimless 480 high BTW pan COMBTWPAN48SN. Thank you. Hi Anne, yes the RAK Compact Wrap Over Toilet Seat is compatable with the RAK Standard Back To Wall Pan (COMBTWPAN). Thankyou. RAK Compact Wrap Over Urea Toilet Seat. My toilet seat arrived promptly and expertly packaged. Fitting the new seat was very easy, taking only moments for my toilet being functioning again. Excellent service and product. Easy to fit with easy to follow instructions. Perfect fit looks right and works well. "Easy to fit, does the job." Purchased as a replacement for an older RAK seat which the seat had broken off. The original seat and toilet had been purchased around 6 years ago. Since then RAK have made some significant improvements to the fittings which allow the seat to be removed for cleaning at the touch of a button. The toilet seat was very easy to install nice finish very satisfied. 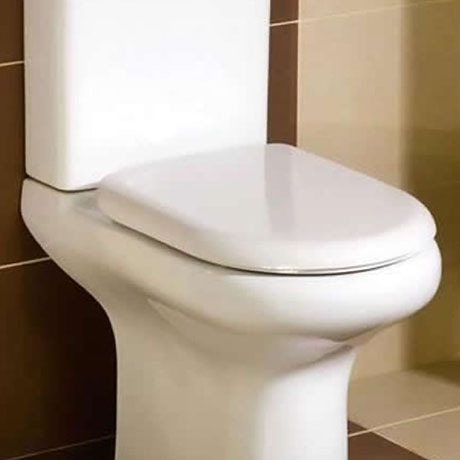 As I needed a replacement for my old Toilet seat, searched and found Victoria Plumbing.There it was really easy to get all the correct information concerning style, size and so on. The ordering process was also simple,the Courier Victoria Plumbing uses informed us as soon the order has been dispatched with tracking number and date of arrival. The product arrived as promised within the time frame,would any time again use Victoria Plumbing for further orders. The seat is well constructed and has a very solid feel to it. Fitting is easy, however, I was sent the incorrect hinge pins. Customer services replaced these, but the seat could not be fitted for four days between the receipt of the seat and the arrival of the correct part.The securing screw lengths on the hinges could do with being slightly longer, due to the depth of bowl.